What is blended learning? What are the benefits to a blended learning approach? What are some strategies for getting started? This guide helps instructors answer these questions by describing the elements of an effective, learner-centered “blend” derived from research and evidence-based practices. In addition, the guide offers questions that instructors can reflect on before designing their course and additional references and resources. This guide is particularly useful to faculty applying for the Provost’s Hybrid Learning Course Redesign and Delivery grant program and similar requests for proposals. Contact the CTL with questions or suggestions to help inform this guide at ColumbiaCTL@columbia.edu. Blended learning is a learner-centered approach that integrates complementary face-to-face (synchronous) and online learning (asynchronous) experiences in service of intended learning objectives.1 2 While some definitions of blended learning focus primarily on the amount of time spent in each method of delivery by considering the percentage of content delivered face-to-face vs. online (Hew & Cheung, 2014; for instance according to Allen and Seaman, 2007, blended learning would have 30 to 79% of content delivered online), the focus here is on using an intentional “blend” of online and face-to-face instruction that is best suited to enhance learning for all students. Blended learning is not about “adding on” online learning experiences to a traditional face-to-face course (this is known as the “course-and-a-half phenomenon,” and it adds workload for both the instructor and the student3) but rather the careful consideration of what parts of learning should occur in person / in community with the guidance of the instructor, and which can occur online on the learner’s own time. See Table 1 below to distinguish the features between traditional in-person learning, web-enhanced, and blended/hybrid learning. All course content and learning experiences are delivered in a face-to-face format in writing or orally through lectures, discussions, labs, or other learning activities. No web-based technology is used. Includes all the elements of a traditional course but uses web-based technology to facilitate learning. E.g., using Courseworks (Canvas) to post course materials – textbook information, a syllabus, and readings. Blend in-person and online learning experiences. Online learning not an “add-on” but integrated into the course and replaces a portion of class time. Web-based technologies to deliver content and maximize learning through activities (e..g, online discussions; quizzes, etc.). Adapted from Allen, Seaman, and Garrett, 2007; and Allen & Seaman, 2007; Mayadas, Miller & Sene, 2015. Blended learning and hybrid learning are often used synonymously in the literature4 5, the same is true at Columbia University. Hybrid learning at Columbia is supported by the Office of the Vice Provost for Teaching and Learning and encourages “approaches that re-imagine class as a space for active and collaborative learning.” The CTL has worked with Columbia professors awarded hybrid RFPs (Requests for Proposals) grants, many of these projects* experiment with blends of varying degrees, placing 20 – 50% of face-to-face course content online. The CTL approach to the flipped classroom is to guide faculty decisions toward the design of high-impact activities that make the best use of face-to-face (synchronous) and online (asynchronous) modalities. This means going beyond generating video lectures that students are instructed to watch prior to classroom experience, to exploring innovative ways to facilitate student learning that intentionally leverage technologies and draw on evidence-based practices. Visit the Office of the Vice Provost for Teaching and Learning’s website to learn more about the Hybrid Learning Course Redesign and Delivery Request for Proposal, and view past awardees and courses funded by the Office of the Provost since 2014. Deeper, more meaningful learning. In-class guidance from the instructor combined with sequential online experiences provide greater opportunities for students to learn course content, to practice higher-order skills (e.g., critical thinking, inquiry, reflection),11 and integrate their learning. There are more opportunities for students to receive feedback on their learning. Meeting the needs of diverse learners. Leveraging web-based technologies can provide flexibility and increase access to learning opportunities and support resources for all learners.15 16 17 Students engage with learning resources and course content on their own time, pace, and place reducing cognitive load and increasing accessibility.18 19 They can review information and practice skills with greater frequency.20 Instructors can use the data generated from online platforms and technologies to evaluate student learning and their course, making adjustments accordingly. Promote student ownership of learning. A blended approach provides students with opportunities to use the learning resources and experiences curated by the instructor in customized ways. To do so, requires that instructors design courses to promote the development of students’ metacognition.21 Students benefit from instructor guidance as they develop their self-directed learning skills. More opportunities to develop a learning community in the course. Class time can be used for collaborative peer learning activities. Students have opportunities to interact and collaborate in class and in online interaction.22 Instructors are more likely to achieve 100% participation through online components as students have time to reflect on material23 and make more meaningful contributions and connections across course content. Instructor provides guidance on how students learn in a blended course,27 28 helping students develop their self-directed learning skills. Assessment that is ongoing and provides students with multiple opportunities to demonstrate their learning.29 As well as an evaluation plan to know what aspects of your blended approach were impactful on your students’ learning and what are areas for improvement. When considering a blended approach, it is necessary to rethink instructional design, as it is a departure from a traditional course design. It requires thinking about how to use in-person and online modes of learning that meet the needs of your students, and identifying appropriate tools and strategies that facilitate student learning. Instructors planning a blended approach should note that this is a deeply reflective process. It requires making time to think about your teaching, your learners, and the science of learning and using the literature on effective blended learning approaches to inform your practice. Realistically, to blend an entire course well can be a 6-month process. 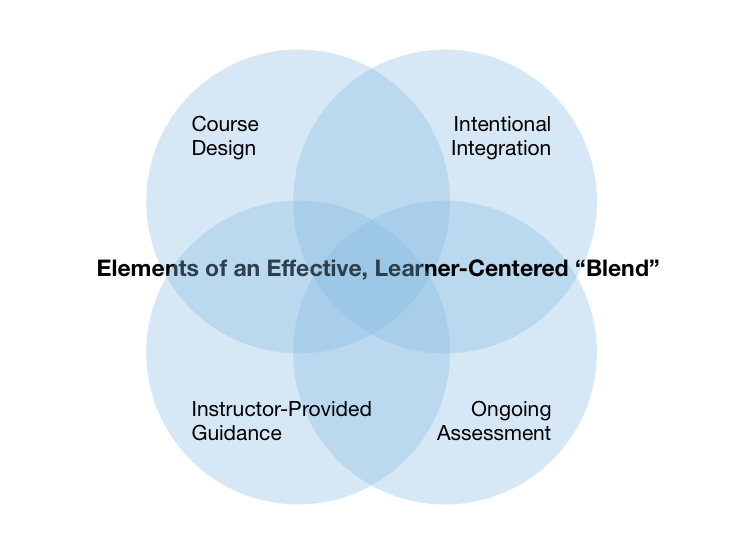 The Center for Teaching and Learning can assist you get started with your blend! Reach out to a CTL Learning Designer to schedule a consultation. What course will you blend? A new course or will you redesign a course? Who are your students? What are their learning needs? What is their preparedness for a blended approach? Who are you as an instructor? What is your comfort level / readiness to teach a blended learning format? What is the right blend for your learners, your course, and you as the instructor? What are the learning objectives that need to be met? What knowledge and skills should students have acquired upon completing the course? What parts of your course will you blend (in-class activities, out-of-class activities and assignments)? Why? Consider what content your students could use a deeper dive to understand. How will you integrate in-person and online learning experiences? How will you assess learning in your blended course? What learning activities will you blend? How will you communicate the blend to your students (including expectations and strategies to maximize learning)? What resources do you have to use in your blended course? Explore existing resources – e.g., Columbia Libraries collections, Lynda.com (an online learning platform available through Columbia that gives you and your students access to a video tutorial library), YouTube, TEDEd (allows you to build a lesson around a TED-Ed, TED Talk or YouTube video), Khan Academy, MIT OpenCourseWare, and Open Educational Resource sites such as OER Commons). Check in with colleagues to see if they have learning objects and videos to share. What resources will you need to create to achieve your blend? Create new media resources using software and hardware available to you. Explore the Teaching with Do-It-Yourself Video guide on the CTL website. What resources and support will you need to achieve your desired “blend”? How will you evaluate the success of your blended course design ? What data will you collect and how will you use the data to assess student learning and your teaching of a blended course? Consider diagnostics, mid-term and final evaluations, reflective essays, journals, discussion posts, quizzes, papers, etc. How will you use the data you have collected to improve upon the blend ? Caulfield and Aycock. (2012). How to Design and Teach a Hybrid Course: Achieving Student-Centered Learning through Blended Classroom, Online and Experiential Activities. Stylus Publishing. Linder, K. (2016). The Blended Course Design Workbook: A Practical Guide. Stylus Publishing. Use the handouts from the book to design your course. Hew & Cheung. (2014). Using Blended Learning: Evidence-Based Practices. Springer. Garrison, D.R. ; and Vaughan, N.D. (2007). Blended Learning in Higher Education: Framework, Principles, and Guidelines. Jossey-Bass. Green, L.S. ; Banas, J.R.; Perkins, R.A. (Eds.) (2016). The Flipped College Classroom: Conceptualized and Re-Conceptualized. Springer. Linder, K.E. (2017). Fundamentals of Hybrid Teaching and Learning. In New Directions for Teaching and Learning. No. 149, Spring 2017, page 11 – 18. Magna Publications (2014). Blended and Flipped: Exploring New Models for effective Teaching & Learning. Faculty Focus Special Report. McGee, P. and Reis, A. (2012). Blended Course Design: A Synthesis of Best Practices. Journal of Asynchronous Learning Networks. Volume 16: Issue 4. Stein, J., & Graham, C. R. (2014). Essentials for blended learning: a standards-based guide. New York: Routledge. Reidsema, C.; Kavanaugh, L.; Hadgraft, R.; and Smith, N. (2017). The Flipped Classroom: Practice and Practices in Higher Education. Springer. Talbert, R. (2017). Flipped Learning: A Guide for Higher Education Faculty. Stylus Publishing. The Center for Teaching and Learning (CTL) offers a variety of programs and services for instructors at Columbia. The CTL can provide customized support as you plan your blended approach through implementation. Enroll in the self-paced Blended Learning Essentials course. Participate in the Active Learning Institute: Flipped Classrooms and Beyond for a facilitated community experience as you design or redesign a blended course. Explore resources shared through the Blended Learning (RewirED series). Reflect and receive feedback on your blended course, sign up for a Teaching Observation. The Hybrid Learning Course Redesign grant program from the Office of the Provost provides support for faculty who are developing innovative and technology-enhanced pedagogy and learning strategies in the classroom. In addition to funding, faculty awardees receive support from CTL staff as they redesign, deliver, and evaluate their hybrid courses. In this video presentation, CTL Learning Designers Jason Guzman and Paul Joseph Stengel present on the CTL’s approach to blended learning, designing online components in Canvas with the Community of Inquiry Framework, and redesigning face-to-face activities and assessments. CTL resources and technology for you.